Simplus | Celebrating 300 strong at Simplus! 13 Jul Celebrating 300 strong at Simplus! As of this month, Simplus has 300 team members across the globe! Our employees are among the finest. They are tenacious, reliable, and experienced critical thinkers–all helping to make us not just the biggest CPQ consultancy in the United States, but also the best. Over 50 of our 300 are located at our Manila, Philippines office (another accomplishment all on its own! ), with the rest covering every region of the United States, Canada, and more. Clearly, distance hasn’t hindered the energy and growth of our underdog spirit. Despite having many remote workers, Simplus has been a wildly successful champion of workplace culture; we’ve received awards for Best Company Culture, Best Company Outlook, Best Company Teams, Best Managers, Top Company Cultures, Best Places to Work, and numerous other culture awards from organizations such as Comparably, Entrepreneur, and Business Insider this year alone. Much of our growth is also thanks to Simplus’ five acquisitions within the past two years. We started with BaldPeak Consulting in 2016; Basati, EDL Consulting, and CRM Manager in 2017; and our most recent CirrusOne acquisition was completed in February of this year. The talent gained through our acquisitions has been vital to developing our strategy and furthering Simplus’ goals—no wonder we greet each new batch of team members with a Welcome Week. 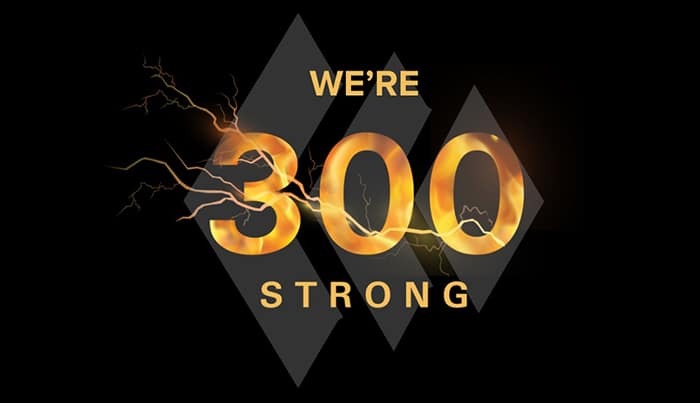 To celebrate our 300 strong and our constantly growing team, Simplus team members will be showing off their 300 strong swag and promoting the feat on social media. A big thank you to all of the customers and employees who have joined us on our epic journey this year! Keep following Simplus to catch all the celebration!